Considered an iconic office chair, the Aeron Task chair by Herman Miller is a popular model that’s even been showcased on TV shows and in movies countless times. But it does have a reputation for being one pricey chair. However, don’t consider the cost of this chair as a luxury expense, it’s as comfortable as it is beautiful and can be used in your office for many years to come. To the untrained eye, this model may not look much different than past models by Herman Miller, but the manufacturer claims that this was intentional. Past models of the Aeron were so popular that the chair itself has an almost iconic status in many offices across the country. But the biggest difference with this model is the chair’s mechanics. The tilt feature on the original model worked using a rubber coil spring which would allow the chair to lean back when the user pushed back. The new leaf spring on this updated model is designed from strips of glass and reinforced polystyrene resin which has a reputation for improved flexibility. This allows the chair to closely follow the user so that the chair will always remain in contact with their back. 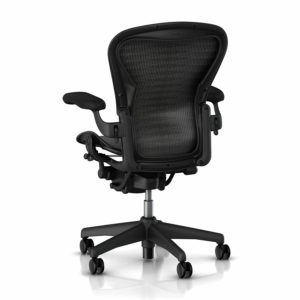 The type of weave that’s used throughout the chair, which is called the pellicle is what truly defines the Aeron. And back when the chair was first introduced, it’s what allowed it to stand out from its competitors, which mainly used tufted upholstered seats. The pellicle style works to boldly expose how the chair functions. The improvements made to this high-quality iconic chair have helped to make it more elegant and functional. Which is why this product received such positive feedback from consumers. To begin with, the backrest and the seat are both made from mesh and work to comfortably mold to the shape of the user’s body. It’s also very supportive, while the mesh paneling material works to promote airflow in order to keep the user cool. 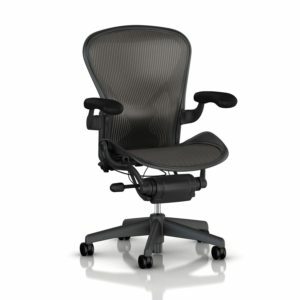 With cheaper chairs, over time mesh materials can wear out and snag, but with the Aeron consumers can benefit from a twelve-year warranty, which just shows consumers how sturdy and tough this chair really is. The size of the chair’s seat is not adjustable. Instead, the consumer must pick the size of the seat that best suits them: sizes A, B, or C. Make sure you check the size chart on the manufacturer’s website prior to purchasing. This chair is truly adjustable. The chair comes equipped with a tilt tensioner which allows the user to adjust the amount of weight it will take to let the chair slide back. Once the chair is adjusted the user can slowly sink backward. The chair actually goes back all the way, which is sort of a design flaw. Consumers can add an optional tilt limiter at an additional cost. Another tilt limiter with added forward tilt is recommended for taller users. This feature allows the chair to slightly lean forward over a desk. Most consumers felt that neither of these extras was crucial to the overall comfort of the chair. There are also a couple of back support options to choose from. The chair’s mesh material does a fine job on its own, but if you’re stuck behind a desk all day or you suffer from ongoing back problems, extra support is a must. The manufacturer gives you a couple of options to choose from. The chair’s posture fit includes a butterfly-shaped pad that works to support the lower back. The pad can be adjusted to provide the user with less or more support using a dial found on the side of the chair. For most consumers, the lumbar support is a much better option. This pad will support the lower back and features a couple of depths: deep and shallow. The user can adjust this support feature by simply sliding the pad up or down in the housing. Once the right position is found the consumer will instantly feel that essential added posture support which can prevent them from slouching. Pros: Assembling the chair only takes about fifteen minutes, which is a huge bonus for consumers. The overall elegance, sturdiness and functionality are what really sells this chair. As it continues to offer the type of comfort it has over the past several years, the added improvements make this chair worth every penny. Cons: Some consumers had issues with the size of the chair’s seat, which is why it’s important to pay close attention to the manufacturer’s size chart before you order. Another consumer had complaints regarding the chair’s main support cylinder for the height adjustment, stating that it started to leak shortly after purchase. The consumer contacted the manufacturer and was able to exchange the chair for a new model. Another complaint involved the depth of the seat, which can end up putting a lot of pressure on the back of the user’s legs. Issues with the chair’s forward tilt mechanisms and hydraulic height adjustment are somewhat common. Consumers noted this was an issue that occurred during the delivery process and simply required the consumer to reconnect a dislocated wire. While the assembly process was simple for many, some consumers had issues when it came to putting together the lumbar support. The included instructions are described as vague and even visiting the manufacturer’s website didn’t help much in terms of troubleshooting. Fortunately, consumers described the customer service team as helpful and eager to solve any troubleshooting issues. Consumers who just can’t afford the high price tag that comes with this model can check out the Serta Back in Motion office chair, which is priced more affordably. The issues some consumers ran into were not common and were covered under the product warranty. This iconic chair remains one of Herman Miller’s top-selling models and has also won a place as a consumer favorite. Consumers who purchased the Herman Miller Aeron Task Chair gave it a high rating of five out of five stars for color options, functionality, overall comfort, and the classic design.